If this post is incoherent, it's because I've finally succumbed to exhaustion. Someone send me to one of those resorts/rehab facilities for celebrities, where I can go drink cucumber water and let other people take care of all my crap! Who knew that setting the stage for a book release was so much work? I guess it isn't unless you make it that way. There's just an endless amount of things you can do to try to promote a novel and, though I'm sure some amount of it doesn't work, you want to exhaust every possible opportunity. At least I do. Still, I'm not complaining because I'm beyond excited (and not suave enough to hide it), but … I am tiiiiiiired. Anyway, all that sleepiness certainly disappeared for a hot second, when Vicki, my editor at St. Martin's Press, sent me the above book cover, which is close to the finished version. Yay! I'm especially grateful for the effusive blurb from writer Molly Jong. It's just so comforting to get positive feedback at this juncture. 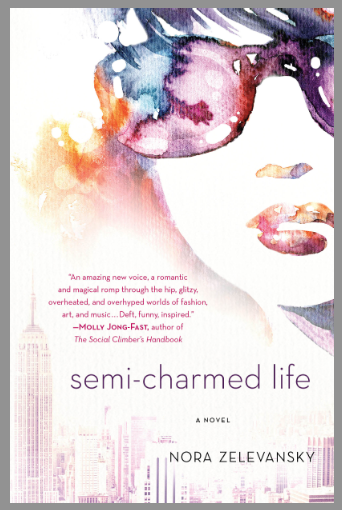 I've taken to Googling myself and the title, Semi-Charmed Life, kind of consistently (yeah, whatever, I admit it) to see if there are any new developments online. That's how I discovered that I'd been added to Goodreads and, just this week, that the book seems to be available for pre-order at Target.com. LOVE me some, Targé! That was very exciting for me. For Style.com, a round-up of new spring spa treatments. My Dame Magazine story on giving up cilantro for a year to become a millionaire and also a story on why smart women like "bad" TV. A Huffington Post story on how I can't tell the difference between Park Slope and Portland. My Huffington Post interview with Project Runway All Stars winner, Mondo! A short interview for C Magazine with famous oncologist Dr. Agus about his new book, The End of Illness. An interview with the goat farmer and creator of Laloo Ice Cream. That's all for now! Excuse me while I go pass out.